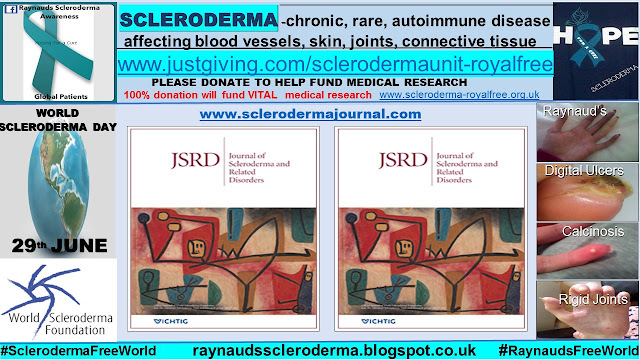 Raynauds Scleroderma Global Patients: The Journal of Scleroderma and Related Disorders (JSRD) Volume 1 Number 1 Jan-April 2016. The Journal of Scleroderma and Related Disorders (JSRD) Volume 1 Number 1 Jan-April 2016. Volume 1 Number 1 Jan-April 2016. The JSRD is the official journal of The World Scleroderma Foundation, WSF, and The European Scleroderma Trials And Research Group, EUSTAR. ‘Systemic sclerosis (Ssc) or scleroderma remains the disease associated with the great burden of morbidity and mortality, even though a prominent paradigm shift in treatment strategies has changed clinical practice of many rheumatic diseases. Despite a series of clinical and basic researches, the pathophysiology of Ssc has not been fully clarified, and effective disease-modifying therapies are still lacking. However, we strongly believe that the outlook for Ssc and related disorders is now changing rapidly. During the past decade, a variety of new molecules, pathways, and cell types have been identified as critical players in the diverse manifestations of Ssc. Much of this research has been made possible by the application of gene expression profiling, genomics, and proteomics with powerful analytic platforms, such as microchip array techniques. The importance of the epigenetic control in the pathogenic mechanisms reflects the interplay of environment with the genome. These cutting-edge strategies make it possible to identify and validate novel biomarkers, and to develop precise therapeutic targets……. These enormous efforts significantly enhance bench-to-bedside research interplay, and basic discoveries are promptly translated into clinical trials at an increasingly rapid pace. ‘In this era of reform, the Journal of Scleroderma and Related Disorders (JSRD) has been started as an international, multi-disciplinary, peer-reviewed journal, targeting scientists and clinicians interested in Ssc and other related autoimmune and fibrotic diseases. JSRD is the official journal of the European Scleroderma Trials and Research group (EUSTAR) and the World Scleroderma Foundation, which supports Ssc research in all its aspects and is committed to improving the quality of life for Ssc patients and their families. The commemorative first issue was published in February 2016 to coincide with the 4th Systemic Sclerosis World Congress. The 1st Systemic Sclerosis World Congress was successfully held in 2010 in Florence, Italy. Since then, this congress has become the primary platform for exchange of scientific and clinical information through an interaction between practicing or training physicians, scientists, health professionals, patients, and representatives of the pharmaceutical industry throughout the world. 2 Editors in Chief, 4 Senior Editors, 5 Honorary Editors, 8 Associate Editors, 10 Assistant Editors, 73 Editorial Board members. 14 Oral Presentations; 12 posters, abstracts presented at the Congress. The articles included in the Advance Online Publications section have been peer reviewed and accepted by the JSRD and are published online after author approval. I would urge every patient to sign up for their own copy of JSRD. Even if you can not understand all of the contents due to the medical and scientific terminology, the contents provide huge assurance to the global Raynaud’s and Scleroderma community that the world leading experts are collaborating with each other, to improve the entire Raynaud’s and Scleroderma patient experience. This is very important in relation to seeing an advancement in science, to ensure the scientific statistic analytical parameters are met, large numbers of patients are required, and of course, scleroderma is a rare disease, with only 2.5 million patients worldwide. Please DONATE to help fund medical research at the Scleroderma Unit, The Royal Free Hospital, London, where 100% of your donation will be used for research only. Thank You. United, globally, together, we will crack the Raynaud’s Scleroderma (Systemic Sclerosis) code. Living the dream Scleroderma Style, hoping for a cure. An edited version of this article was published here, in my Column with Scleroderma News, April 2016.